Let me tell you this watch in not rare, it is something none of my Citizen collector friends knew it existed. If you saw another one, let me know. To add to this story, it comes in mint NOS condition, with price tag, model tag, papers, box (inner and outer one), stickers… complete package as the day it left the Citizen factory so long ago. By the way, it was made in 1969. Now let’s get to the watch itself! 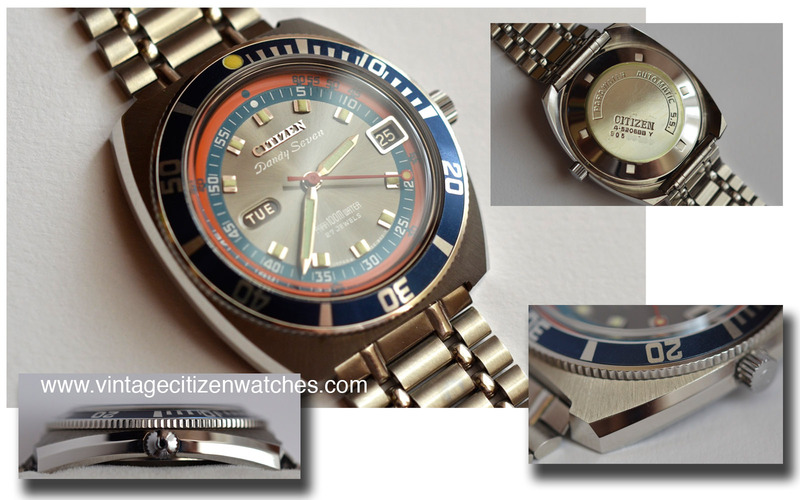 Citizen named it Dandy Seven Diver and marketed it as a powerful waterproof watch designed for underwater use. The powerful Citizen “Parawater” (waterproofing) enables this watch to resist 10 atmospheric pressures at the depth of 100m underwater. It is equipped with a register ring that indicates the time lapse and the remaining time after submerging, and a safety diving depth graduation witch indicates the safety limit of diving depth and acts to prevent submarine sickness. Thus, it can be said that this watch is ideal for those who make diving their profession and therefore it is called the true diving watch. What can I say, it is a true diving watch and such a beautiful one! I love the colors, the shape, the size. The bezel is bidirectional friction type (as most of the Citizen divers are – except from the 500m Chrono Master). The bezel insert has a metallic blue color that contrasts with the orange inner bezel. Blue and orange are complementary colors so this watch really catches your eyes especially in bright natural light. 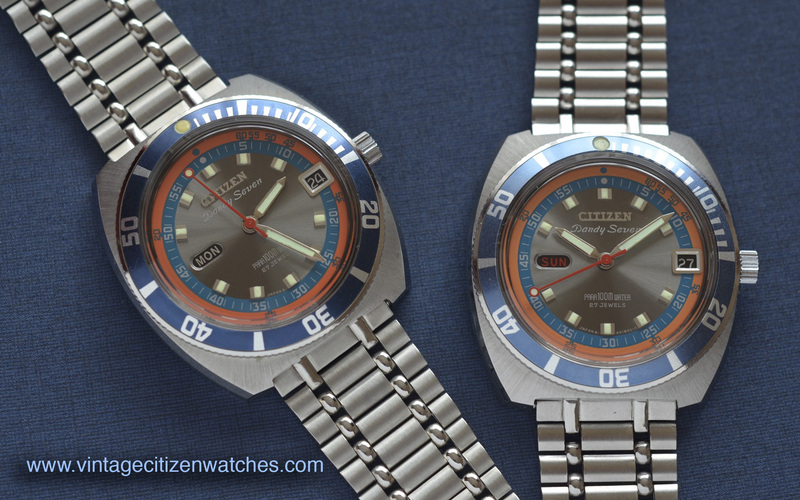 On the bezel Citizen placed a luminous dot rather then the usual triangle. The crystal is acrylic, beautifully bending the light. The crown is signed “C”. Both the case and the bracelet are made in stainless steel and are carefully finished in brushed surfaces and polished ones. The clasp has the usual diving extension Citizen used for a lot of their models. It adopts Citizen’s “Parawater” (powerful water proofing) device and is capable of resisting 10 atmospheric pressures. It adopts a time register ring. It has safety diving depth graduation. An automatic winding watch equipped with a manual winding mechanism. It has clear viewing day and date indicators. Equipped with Citizen’s unique quick date setting device. Adopts Citizen’s unique Parashock (shockproofing) device and unbreakable spring. Regarding the movement, I tried to open it but was afraid to scratch it so I left it this way because as for most of NOS pieces I have found out that this is a difficult and risky operation. I tend to believe that the movement inside is the Citizen calibre 5204? Citizen also provided information about how to use the time register ring, time, day and date setting, and reading the safety diving depth graduation. Also some instructions on the maintenance of the waterproofing quality were given. 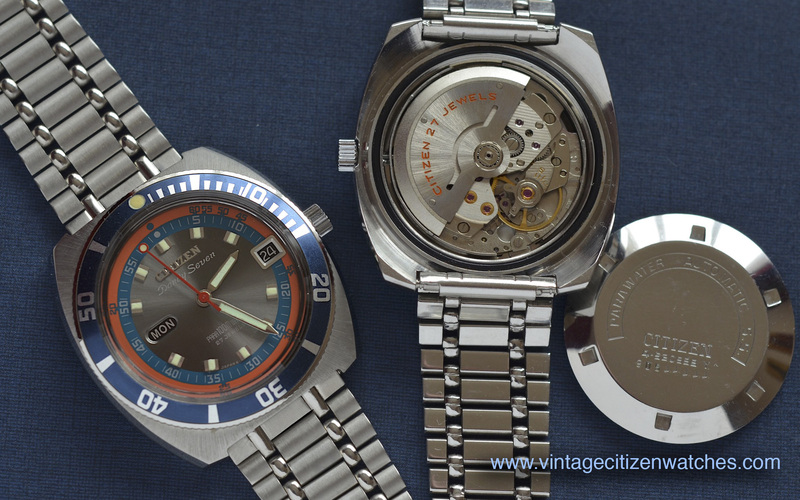 All things considered this is an awesome powerful watch that I hope you like reading about. Awesome Citizen! My first 100% complete vintage Citizen package and such a beautiful, rare one it is! The movement inside is indeed the Citizen calibre 5204. 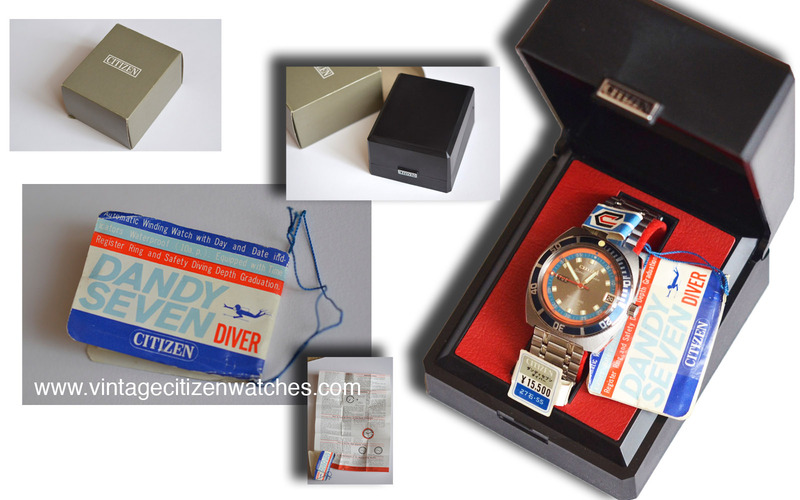 This entry was posted in Citizen date, Citizen diver, day-date, hand winding, parashock, parawater, Uncategorized, vintage Citizen and tagged 4-520688 Y, atmospheric pressures, citizen 4-520688 Y, Citizen calibre, citizen dandy seven, citizen dandy seven diver, Citizen diver, Citizen package, citizen para100mwater, citizen parashock, Citizen Parawater, dandy seven, Diving watch, vintage citizen dandy seven, vintage citizen diver. Bookmark the permalink.